Edward Clarke Cabot is best known today for his architectural achievements, the most famous of which is the Boston Athenæum’s building at 10 ½ Beacon Street, but during his lifetime his artistic output earned him equal praise. The Athenæum holds a significant collection of his watercolors, drawings, and prints that documents a prolific artistic career that began long before his retirement from the architectural profession in 1888. Although few of Cabot’s pieces rise to the level of masterworks, they nonetheless provide an important historic record of artistic trends in nineteenth-century America. 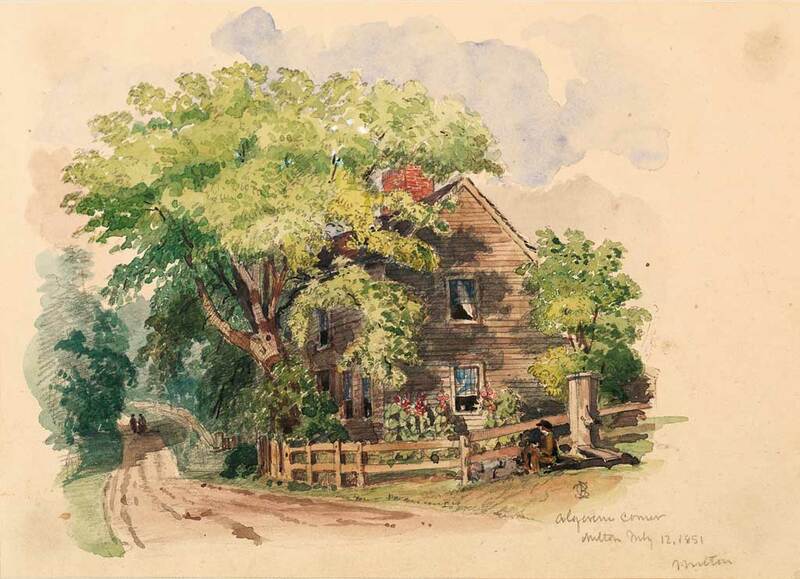 He was a member of the Boston Art Club and the Boston Watercolor Society and exhibited his drawings and watercolors at a number of venues throughout the city, including, briefly, at the Boston Athenæum. The grandson of the Athenæum’s greatest benefactor, Thomas Handasyd Perkins, Cabot served as a Trustee of the Athenæum from 1857 to 1875 and was an influential member of the Athenæum’s Fine Arts Committee. Shortly after the show ended, Cabot exhibited a watercolor at the Athenæum entitled View of Milton – A Sketch. The relationship of this watercolor drawing to Algerine Corner, Milton, is unknown, but it does demonstrate Cabot’s willingness to exhibit his watercolors following the favorable reception given to the British drawings. Those watercolors had been praised for their “completeness,” or their high degree of finish and material representation. Cabot’s Algerine Corner, Milton, cannot be described as “highly” finished, but it did reflect the current fashion for descriptive representations. This becomes more evident when comparing this early watercolor to Cabot’s work in the medium during the 1880s and 1890s. His 1880 watercolor Beacon St. is a rare example of an urban scene in the artist’s œuvre and depicts the dredging of the Charles River Basin near the intersection of today’s Beacon Street and Massachusetts Avenue. Although the subject matter is atypical, the looser brush strokes and the minimal amount of detail are very characteristic of Cabot’s later work. The contrast with the more concrete depiction rendered in Algerine Corner, Milton, could not be more striking. This evolution from specific, detailed depiction towards a more abstract, fluid, and emotional style was not unique to Cabot. In the late nineteenth century, artists in a variety of media were less interested in purely factual representations than they were in evoking the mood and sensibility of their subject. This was particularly noticeable in the medium of watercolor, where the almost abstract work of J. M. W. Turner was widely admired. As the public accepted the artistic legitimacy of watercolor painting, watercolorists were freed from imitating the detail and finish of oil painting and began to use the medium in a more expressive and subjective manner. Cabot’s work was rarely exhibited during his lifetime. In 1902, however, a memorial exhibition at the St. Botolph Club in Boston displayed 108 of his watercolors, drawings, and oils. Over the course of the twentieth century Cabot’s work was widely dispersed, and the Boston Athenæum today has one of the most extensive holdings of his art; this collection provides not only a unique overview of Cabot’s artistic career, but also insight into how individuals responded to and interpreted the artistic trends and fashions of the nineteenth century. Catharina Slautterback from, Stanley Ellis Cushing and David B. Dearinger, eds., Acquired Tastes: 200 Years of Collecting for the Boston Athenæum (2006): 313-316. Copyright © The Boston Athenæum. For an overview of Cabot’s architectural career, see Roger G. Reed, “The Cabot Brothers,Architects 1846-1866” (paper presented at the New England Chapter of the Society of Architectural Historians symposium on Lost Boston Architects, October 28, 1995). L. Vernon Briggs, History and Genealogy of the Cabot Family 1475-1927 (Boston: Charles E. Goodspeed & Co., 1927), 2:690. Charles A. Cummings, “Edward C. Cabot,” American Architect and Building News 71 (February 9, 1901): 46. “The Water Color Society,” Bulletin of the American Art-Union (April 1, 1851): 15. Mesos, “The Athenæum Exhibition IX. Water Colors,” Dwight’s Journal of Music 13 (July 17, 1858): 127-128.